In a large skillet cook garlic in the olive oil for one minute. Add the sliced zucchini and cook for 4-5 minutes. Zucchini be still be slightly crisp. Add the tomatoes, seasoned salt, and pepper. Simmer for 7-8 minutes or until liquid is absorbed. The best part of a gardener's summer is here -- the time when you get to cook with your garden-fresh harvest. Every Monday night as a child, my siblings and I knew that we would be spending the night in the garden as a family picking weeds. We knew we had to pick weeds until there were no more buggers left. I hated it. It always felt like it took eternity. But later when we had fresh tomatoes and zucchini for dinner that I had helped grow, I felt a sense of accomplishment and pride. I guess my parents knew that a garden was an opportunity to sow more than just plant seeds. Do you have a garden? Are you up to your ears in zucchini? If you are having a hard time coming up with new ways to fix all the zucchini you have, this Zucchini Parmesan is ridiculously easy and full of flavor. Just slice up some of that zucchini from your garden and cook it with some garlic. Add some seasonings and diced tomatoes and let it simmer for a couple of minutes. Sprinkle generously with Parmesan and you have a side dish that is fresh, healthy, and delicious. Dare I say the taste kind of reminded me of pizza! 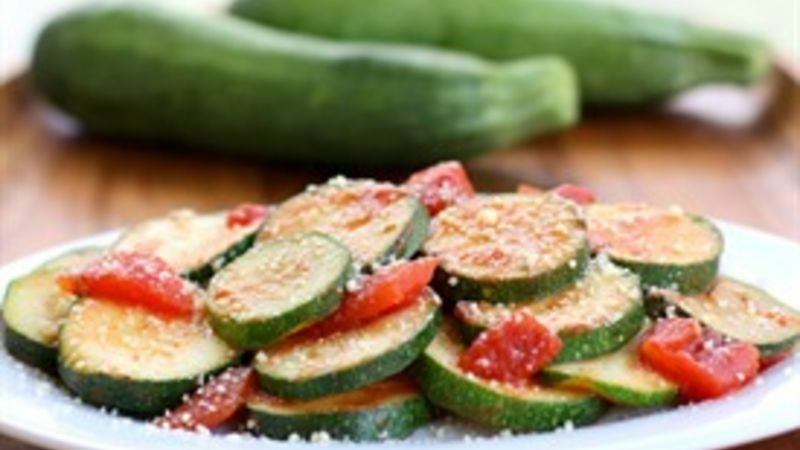 This is sure to have your family begging for more zucchini! And for even more reasons to cheer about zucchini, check out our great collection of Top Rated Zucchini Recipes, too!